There is no question that Ken Gray flies his 2008 Cessna Citation twin turbofan engine jet for business. After all, he is the CEO of CAMP Systems International, a Merrimack software company recently acquired by Hearst Publishing, which provides maintenance and inventory monitoring and flight scheduling to thousands of aircraft owners. So he travels mostly to small general aviation airports, much like where he is based: Nashua Airport. It would take him all day to fly commercial to a place like, Wichita, Kan., where he would probably be routed through Dallas. But on his six-seater, he can soar above those commercial airlines at 480 miles per hour straight and arrive in three hours, hold a meeting along the way, laptops plugged in, coffee brewing nearby. Still, there is no denying it. It’s also nice to use it to fly nonstop to Florida to vacation with the family. “You could leave after breakfast and get there by lunch. No lines, no security. A private jet is a very good business tool, but it’s a very nice personal luxury too,” he said. So it’s worth it to Gray, even if the aircraft cost him millions of dollars to purchase, hundreds of thousands of dollars a year to fly and tens of thousands of dollars in registration fees to just sit on the ground in New Hampshire, which is now one of the most expensive places in the region to base a jet. In fact, when it comes to attracting new high-end corporate jets, the state of New Hampshire is now at a clear disadvantage. An attempt to change that reality has stalled in mid-flight and may be blown off course by turbulence coming from competing interests — those representing the corporate jet owners, hobbyist flyers and those looking out for the interest of the airports themselves, particularly the smaller ones. And although this issue is flying under the radar, aviation is a big deal in rural New Hampshire. There are more than 1,600 aircraft based in New Hampshire, according to the Federal Aviation Administration’s database, more per capita than any surrounding state, though Maine is pretty close. And while most of these aircraft are a far cry from the aforementioned corporate jets — small propeller planes, drones or hot air balloons — they do contribute to the economy. General aviation — that means everything but commercial airlines and military aircraft — contributed at least $100 million to the state’s economy in 2013, generating 776 jobs, according to the 2015 State Airport System Plan released by the NH Department of Transportation’s Bureau of Aeronautics. That doesn’t include the three primary airports offering commercial airline service — Manchester, Pease and West Lebanon, which contribute $1 billion, even though they offer general aviation as well, indeed a large chunk of it. The prevalence of aviation in New Hampshire should come as no surprise. The Granite State, without a personal income tax, ranks as among the best places for highly paid executives to call home. Until a decade ago, it was also the best place to park his jet. There were low landing fees, fuel taxes and, most importantly, no sales tax. Yes, New Hampshire did have an annual registration fee — six mills for new aircraft, which was reduced a mill a year until the owner of a seven-year-old jet was only paying $63, plus a penny per pound. Still, that was nothing compared to Massachusetts’ 6.25 percent sales tax, which was 10 times the registration fee. But about a decade ago, Massachusetts exempted aircraft from its sales tax. It now costs $300 to base a new corporate jet at Hanscom Field in Bedford, Mass. —even a Gulfstream 550, the ultimate luxury jet, which would cost about $340,000 to hangar in Nashua Airport. Hanscom is 40 minutes by car from Nashua, and less than 10 minutes, as the Gulfstream flies. 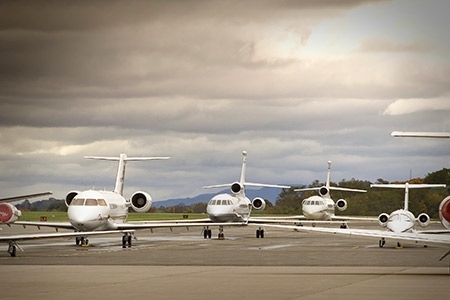 As a result, some 72 jets have registered in the last four years at Hanscom, where only four were in Nashua, said Shane McLaughlin, an attorney who represents jet owners. Hanscom hangars now have a waiting list, while Nashua’s is looking for customers. McLaughlin says he is talking to many high-end clients who are reluctant to speak for themselves, because they value their privacy and often register their jets under corporate names. Gray’s jet for instance was registered under Mountainview Aviation. Auto mogul and former Balsams partner Dan Dagesse’s 2009 Hawker Beechcraft is owned by D and E Aviation. John Abele, co-founder of Boston Scientific and the richest man in Vermont, is one manager of Independence Aircraft, which owns a 2002 Cessna 560XL. McLaughlin also has a personal interest in the matter. The Hollis resident, who learned to fly from his father and soloed when he was 16, also followed in the family business, developing and leasing hangars at Nashua. So he brought the issue up to Don Lebrun, a Nashua alderman who is the board’s liaison to the airport and a state representative. Lebrun promptly sponsored House Bill 124 which would eliminate the fee. The bill flew though the House on a voice vote, but it was grounded in the Ways and Means Committee, which retained the bill on March 16. That was primarily because of the concerns voiced by pilots and operators. The registration fees collected by the state is the only source of operational aid the airports get, at least from New Hampshire. The state does contribute about $1.4 million to some 42 active improvement projects. The federal government picks up 90 percent of the rest of the $33.7 million bill and the state’s share is matched by local airports. Even when it comes to the registration fee — $1.25 million collected in 2016 — the airports only receive a quarter of what they generate, some $291,000. The rest goes to the general fund, as well as about $250,000 raised through the jet and aviation fuel tax. And no doubt about it: Many of the state’s 25 airports, particularly 13 small airports that don’t get any federal funding, are struggling. The state used to subsidize them, but that ended around the recession, and unless there is some future funding source, only a few might survive, according to the Airport System Plan. “We don’t want to hurt the airports,” added Sean Collins, eastern regional manager of government affairs for the Aircraft Owners and Pilots Association. Collins said he understands the state’s need to lower fees, but suggested other possibilities. One is to allow airports to keep a greater amount of the registration or fuel fees. The other would be to raise the fuel tax. The current tax of 2 cents on jet fuel and 4 cents on gasoline is far below Massachusetts’ rates of 8 cents and 24 cents, respectively. But Drukker said that the fuel tax would amount to a “drop in a bucket” and not make up for losing more than a million dollars in funding. Collins also suggested it might make sense for the vast majority of aircraft owners on the lower end of the scale to pay a little more, so as not to lose corporate jets, which pay almost all of the fees, he said, though he acknowledged “that might not be such a popular idea with our membership”. 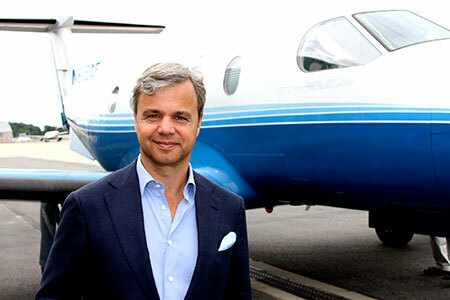 Above: PlaneSense CEO George Antoniadis. PlaneSense operates similar to a timeshare. With double-digit growth in recent years, PlaneSense contributes $27 million to the state’s economy. 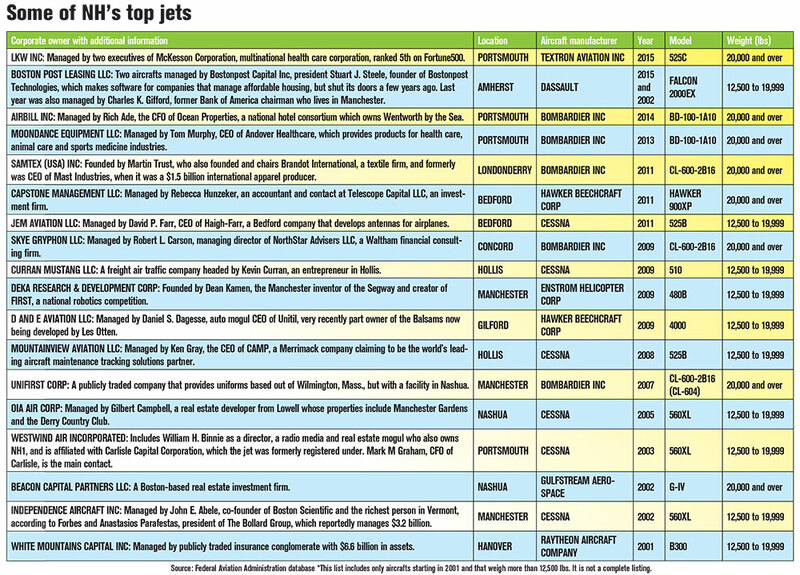 There aren’t that many high-end aircraft in New Hampshire. 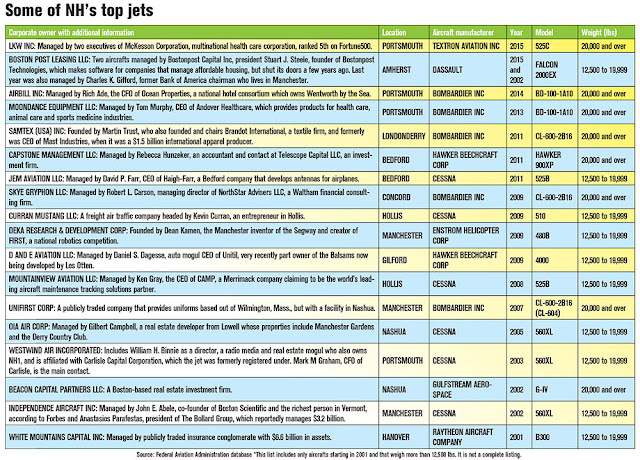 Of the 1,670 aircraft registered in the state, only 60 are above 12,000 pounds, and two of them are helicopters. About half of them are more than 20 years old and one — of 1944 vintage — is owned by Dakota Aviation Museum Inc. So it is no surprise that in 2015, for instance, 18 aircraft were responsible for about 83 percent of all registered fees, said attorney McLaughlin. Indeed, one aircraft was responsible for 28 percent of the total. But it’s more than fees, he said. There are pilot salaries, maintenance crews, insurance and hangar fees. The jets are used to fly in clients who spend money. “They create jobs, they pump life into the economy,” he said. It isn’t just corporations, executives or millionaires who are owners of the aircraft. They’re also owned by charter jet companies that rent out their planes and, more prominently, PlaneSense, a fractional share company that houses 24 turboprops and a handful of small jets at Pease. PlaneSense is like a timeshare in the air, allowing customers to buy a part of a new plane — a minimum cut of $342,000 for an aircraft worth about $5 million — plus a monthly management fee and an hourly rate when you fly. If you add it all together, including depreciation, it all comes out to about $3,000 an hour. (The cost is different for a jet, which can be as much as $11 million). That, when it comes to the business traveler trying to avoid the hassles of either ownership or commercial air travel is “a responsible choice,” in the words of CEO George Antoniadis. Apparently, it’s one that is becoming increasing desirable. Antoniadis said that PlaneSense has experienced double-digit growth in the past few years and now contributes $27 million to the state’s economy alone, including about a fifth of the $1.25 million in registration fees paid to the state last year. “We want to be a good player in New Hampshire, and we are a good player. Damn good player, I would say,” he added. Antoniadis is not about to skip over the border because of fees, but he would devote more resources in the state without it, he said. Besides, he thinks the fees are unfair. His customers expect a new aircraft, so he pays the “quasi-sales tax” for six years on a plane that he unloads in 10. The tax has a perverse incentive of discouraging the purchase of new, more efficient equipment, he said. The fuel tax, he said, at least has the benefit of prioritizing fuel efficacies but he is against increasing fees on smaller planes. On the one hand, he said, “my position is that what is good for the jets is good for everybody.” On the other hand, “we are not looking to raise our rates on the little guys,” particularly since it won’t make that much of a difference. He might also favor increasing the fuel tax (particularly on jet fuel), but that won’t make much of a difference either. Rather, he would prefer that airports be allowed to keep more of the registration fees they generate, and spread them out more, since lowering registration fees for the larger, pricier jets would benefit the larger airports that can accommodate them. Since the fees would go back from where they came, 97 percent would go to five airports: Manchester, Nashua, Keene, Laconia and Pease, said Tricia L. Schoeneck Lambert, administrator of the Bureau of Aeronautics. On the Seacoast, for example, in the last fiscal year, Pease received $123,500 in registration fees, about 5 percent of the airport’s $2.5 million budget, said Paul Brean, Pease’s airport director. Skyhaven, in Rochester, collected $229, or about one-tenth of a percent of its $175,000 budget. This seems to indicates that the small airports really don’t have much to lose if the fee goes away, but a lot to gain if they get a larger piece of a smaller pie. Finally, there is the question of whether the fee would actually drive anyone to base their plane elsewhere. Part of the reason you want to own your own plane is convenience, so you want to live near where it’s based, said Ken Gray of CAMP Systems. “And I wouldn’t want to live in Massachusetts,” he said. Indeed, Gray would favor spreading the fee out more, so older planes would pay more, even if that it meant he would pay more himself. “It is just less regressive,” he said. The Telluride Airport Authority Board has chosen a likely successor to longtime airport manager Richard Nuttall, whose contract expires at the end of this year. At last Thursday’s board meeting, Kenneth Maenpa, a Denver-area aviation executive, was the board’s unanimous choice. The question now is whether the board’s planning committee will be able to land Maenpa during contract negotiations. Matt Skinner, a board member and chief operating officer of Colorado Flights Alliance, referred all questions to board chairman Jon Dwight. Reached late Tuesday afternoon, Dwight said the negotiating process has just gotten underway. Maenpa’s LinkedIn page lists him as employed as aviation practice group leader for Jacobs Engineering — a global company with comprehensive aviation services and a presence in the greater Denver area — since September 2014. Maenpa’s online resume touts extensive experience in Colorado. Prior to working for Jacobs, Maenpa served as airport director for Rocky Mountain Metropolitan Airport in Jefferson County (March 2005 to September 2014); airport operations manager for Eagle County (February 2002 to April 2003); and airport manager for Garfield County (May 1999 to January 2002). Last summer, the board hired a Florida executive recruiting firm, ADK Consulting, to begin the search for Nuttall’s possible replacement. ADK Consulting specializes in aviation industry searches. Maenpa was among ADK’s top choices for the Telluride position following an intensive search, Dwight said. At the May 18 board meeting, following an invitation from the board’s planning committee, board members interviewed Maenpa about his previous experience. County Commissioner Joan May asked Maenpa why the Telluride job appeals to him. The candidate replied that he liked the location and noted his experience with Western Slope airports. He said that TEX was well-managed and he wanted an “opportunity to be a part of that.” He also gave credit to the airport authority board. Board member Lynne Beck, finance director for the Town of Telluride, asked him how well he has done with airport budgets. Richard Child, an alternate member of the board, pointed out Maenpa’s “impressive credentials” before asking him how he would handle coming into TEX at a time of short- and long-term restructuring. “What approach would you take to maximize the team’s efforts and resources given to you to keep the airport going and not skip a beat?” Child asked. Over the winter months, the Daily Planet received letters to the editor from several community members in support of the airport board retaining Nuttall for the next couple of years. Nuttall, who has served as Telluride Regional Airport (TEX) manager for nearly 25 years, has not commented on the situation involving the search for his replacement. Currently he is overseeing several construction projects at the airport. The private pilot performed two low passes to the snow-covered airstrip, during which the airplane’s flaps were extended and carburetor heat was on. After completing the second low pass, the pilot retracted the wing flaps, turned off the carburetor heat, and applied engine power to go around. The engine subsequently experienced roughness and a partial loss of power. The pilot turned the carburetor heat back on, but engine power was not restored. Unable to maintain altitude, the pilot elected to land on the airstrip he had been overflying. During the landing, the airplane nosed over due to the depth of the accumulated snow, which resulted in substantial damage. A postaccident examination of the carburetor revealed full control continuity to the carburetor heat/air box, the butterfly valve reached full travel, and full control continuity from the cockpit throttle and mixture controls to the carburetor was confirmed. An engine run revealed no anomalies. Although the airplane was operating in conditions that were conducive to a serious risk of carburetor ice accumulation at a descent power setting, the engine was operating at a takeoff/go-around power setting at the time of the loss of power, and it is unlikely that carburetor ice would have accumulated during this time. Therefore, the reason for the partial loss of engine power could not be determined. On January 1, 2016, about 1530 Pacific standard time, a Piper PA18-150, N2684A, was substantially damaged during a precautionary landing to a private dirt airstrip following a partial loss of engine power near Newman Lake, Washington. The private pilot, the sole occupant of the airplane, was not injured. Visual meteorological conditions prevailed for the local flight, which was being operated in accordance with 14 Code of Federal Regulation Part 91, and a flight plan was not filed. The local flight departed Felts Field (SFF), Spokane, Washington, about 1500, with the destination being a private airstrip about 13 nautical miles northeast of SFF. In a statement submitted to the National Transportation Safety Board investigator-in-charge, the pilot reported that after departing SFF, his intention was to make several slow, low passes over the private airstrip, which was located about 13 nautical miles northeast of SFF. He initially climbed to 6,000 ft mean sea level, cycled the carburetor heat while on descent to the airstrip, then made an initial low pass with full flaps and carburetor heat applied, followed by a go-around with carburetor heat off. The pilot opined that he subsequently made a second low pass in the same configuration, but during the go-around experienced engine roughness, a loss of power, the engine backfiring, and a loss of engine rpm from 2,400 to 2,200. He then applied carburetor heat, but there was no increase in rpm. Unable to maintain altitude, the pilot elected to make a precautionary landing on the private airstrip, which was covered with what the pilot described as covered with snow. Upon touchdown the airplane nosed over, which resulted in substantial damage to both wing struts and the rudder. A postaccident examination of the airplane and engine overseen by a Federal Aviation Administration aviation safety inspector, which included an engine run, revealed no preimpact malfunctions or failures that would have precluded normal operation. During the examination the inspector noted that the carburetor heat/air box had full continuity, the butterfly valve reached full travel, and full continuity of control was confirmed from the throttle and mixture controls in the cockpit to the carburetor. At 1450, the weather reporting facility located at SFF reported wind calm, visibility 10 miles, sky clear, temperature -7 C, dew point -9 C, and altimeter reading of 30.52 inches of mercury. The carburetor icing probability chart from the FAA Special Airworthiness Information Bulletin (SAIB), CE-09-35 Carburetor Icing Prevention, indicated that the airplane was operating in an area associated with a serious risk of carburetor ice accumulation at descent power. On January 1, 2016, about 1530 Pacific standard time, a Piper PA18-135, N2684A, was substantially damaged during a precautionary landing following a partial loss of engine power near Newman Lake, Washington. The private pilot, the sole occupant of the airplane, was not injured. Visual meteorological conditions prevailed for the local flight, which was being operated in accordance with 14 Code of Federal Regulation Part 91, and a flight plan was not filed. The flight had departed Felts Field (SFF), Spokane, Washington, about 1500, with the destination being a private airstrip about 13 nautical miles northeast of SFF. The pilot reported that after reaching the destination airstrip, he overflew the strip in order to judge the depth of the snow on the runway. Subsequent to the second orbit over the runway, and after adding climb power, the pilot observed a power reduction from 2,400 rpm to 2,200 rpm. After attempts to restore power were unsuccessful, the pilot elected to make a precautionary landing on the snow-covered airstrip. Upon touching down the main landing gear dug into the snow, which resulted in the airplane nosing over. The airplane sustained substantial damage to the wing struts and the rudder. The airplane was recovered to a secured location for further examination. The U.S. Treasury is reviewing licenses for Boeing Co and Airbus to sell aircraft to Iran, department head Steven Mnuchin said on Wednesday, telling lawmakers he would increase sanctions pressure on Iran, Syria and North Korea. "We will use everything within our power to put additional sanctions on Iran, Syria and North Korea to protect American lives," Mnuchin said in testimony to the House Ways and Means Committee. "I can assure you that's a big focus of mine and I discuss it with the president." Mnuchin did not elaborate on the review of the licenses, which were issued under a 2015 agreement between Tehran and world powers to lift sanctions in return for curbs on Iran's nuclear activities. His statements followed President Donald Trump’s Middle East trip, in which he called on Iran to stop funding "terrorists and militias." The review suggests that Trump's support for Boeing's defense and jetliner businesses could have political limits. Mnuchin told the Ways and Means hearing that sanctions "really work" and were responsible for bringing Iran to the negotiating table ahead of the nuclear deal. Boeing said in December it would cut 777 output by 40 percent this year under plans that include IranAir's still-tenative order. "Boeing continues to follow the lead of the U.S. government with regards to working with Iran's airlines, and any and all contracts with Iran’s airlines are contingent upon U.S. government approval," a spokeswoman said by email. The commercial pilot reported that, about 30 seconds after takeoff, while the airplane was 250 ft above ground level, the engine began to emit an unusual sound, and he felt a vibration. He chose to land immediately and, due to obstacles ahead, he turned back toward the airport. He completed a steep turn and descended rapidly with the engine producing only partial power. Unable to maintain altitude, the airplane subsequently touched down hard on the runway. The pilot swerved to avoid oncoming traffic, which resulted in the right wing impacting a runway sign. A postaccident examination of the engine revealed that there was a large hole on the top of the crankcase. Two connecting rods were separated from the crankshaft and exhibited mechanical and thermal damage, consistent with oil starvation. Oil streaks were found near the taxiway and run-up area, consistent with the airplane extruding oil before takeoff. When compressed air was directed into the oil cooler, air expelled from a small gap between mating brazed plates, indicating that oil could have extruded from that location. The partial loss of engine power during takeoff due to oil starvation. On May 09, 2015, about 1015 Pacific daylight time, a Piper PA32-300 Cherokee Six, N4124R, made a forced landing following a total loss of engine power at the Redlands Municipal Airport, Redlands, California. Kamasano, LLC. was operating the airplane under the provisions of 14 Code of Federal Regulations (CFR) Part 91. The commercial pilot and four passengers were not injured; the airplane sustained substantial damage. The personal cross-country flight was originating from Redlands with a planned destination of Oceano County Airport, Oceano, California. Visual meteorological conditions prevailed, and a visual flight rules (VFR) flight plan had been filed. In a written statement, the pilot reported that about 30 seconds after takeoff, while the airplane was 250 feet above ground level (agl), the engine began to emit an unusual sound, and he felt a vibration. He noted that the cockpit gauges all displayed normal indications although the noise was disconcerting. The pilot opted to land immediately, and with obstacles and boulders in front of him, he turned back toward the airport. He completed a steep turn, and descended rapidly with the engine only producing partial power. Unable to maintain altitude, the airplane just cleared the airport's perimeter fence, and the airplane touched down hard on runway 08. The propeller contacted the asphalt, and the engine stopped. The pilot further stated that he swerved onto the gravel median to avoid oncoming traffic. The right wing impacted a runway sign resulting in substantial damage. A preliminary engine examination revealed that there was a hole in the engine case near the number four cylinder. Oil streaks were found near the taxiway and run-up area. The Piper PA32-300, serial number 32-40442, was manufactured in 1968. The engine's data plate indicated it was a Textron Lycoming IO-540-K1A5 engine, serial number L-5528-48. A review of the airplane maintenance logbooks revealed the last annual inspection occurred on November 3, 2014 at which time the engine had accumulated 4,911.6 hours total time, and about 465 hours since the last major overhaul. There was a notation that the mechanic added AVBLEND to the oil system at this time. The records indicated that during the last maintenance on March 30, 2015, the mechanic installed a new starter and changed the oil. The oil cooler was replaced in March 2014. An external examination of the engine revealed that it remained attached to the airframe on all the engine mounts. There was a hole in the crankcase located between cylinders no. four and six extending from the cylinder bay upward to the crankcase backbone. A crack in the crankcase extended from the backbone to an area between the no. three and five cylinder bays. An examination of the no. one, two, five, and six cylinders revealed no evidence of foreign object damage or mechanical malfunction. The intake and exhaust valve faces were intact. The no. one and two connecting rods were intact and undamaged; the no. three and four connecting rods were separated from the crankshaft with the rod caps separated. The connecting rods exhibited mechanical and thermal damage. The no. five and six connecting rods remained intact, however, they exhibited severe thermal discoloration. Portions of the no. five and six connecting rod bearings were partially extruded from the rod cap. The oil pressure relief valve was removed from the engine crankcase. The internal spring and ball remained intact; there were five washers in the assembly. A review of the Lycoming Overhaul Manual, Section 9, item 9-23, stated in part "…non-adjustable oil pressure relief valve – Although the valve is not adjustable, the oil pressure can be controlled by the addition of STD-425 washers under the cap as required (maximum of three) to increase oil pressure..."
The oil cooler, stamped Aero-Classics Heat Transfer Products, part number 8000074, was previously removed and visually appeared intact. When compressed air was applied to one of the ports, air expelled from the side of the oil cooler, where there was a small gap between mating brazed plates. It could not be determined the rate at which the oil would seep from the oil cooler when the system was operating. The lives of dozens of young trainee pilots and their families were “devastated” when a pilot training college in Waterford collapsed five years ago after they had paid large sums in fees, an Oireachtas committee has heard. Waterford-based Pilot Training College of Ireland (PTC) was wound up in 2012 with debts of €9 million, most of it owed to students. Kazakhstani national carrier Air Astana was its largest corporate creditor. The Joint Committee on Transport, Tourism and Sport heard a presentation by Brian Kealy and Martina Kealy of the Pilot Training Action Group, established to support those affected by the company’s collapse. They told the committee that, while they appreciated that PTC had been a private company which unfortunately had ended its life with no assets, they wished to highlight the “failure of a public body, namely the Irish Aviation Authority [IAA], to act much earlier”. Ms. Kealy said at least one family had downsized their house to afford the additional fees to allow their son to continue his pilot training. Another family “nearly had their house repossessed” and had a “major row” with a bank. One couple had been under such financial pressure since their son’s “dreams were dashed” that their marriage broke up. Another student had suffered a “stress-induced seizure” and would never be able to fly again, she said. The action group said a range of complaints had been made by students and their sponsors to the Garda Bureau of Fraud Investigation, but no action had been taken to date. Mr. Kealy also told the committee the group had contacted the Office of the Director of Corporate Enforcement, but had never received a response. The 60 or so students represented by the action group were among those most impacted and were owed €2.6 million. In all, some 300 students were hit by the closure. Mr. Kealy told the committee the group believed the IAA had shown “excessive forbearance in allowing PTC to continue to operate”. He said Freedom of Information disclosures showed the aviation authority had reviewed the company accounts of Shemburn, the parent company of PTC, which had a €1 million reported net worth in December 2010. It had not reviewed the group accounts covering its subsidiaries as well. “A review of PTC’s own accounts would have shown a €2 million deficit at December 2010 and €3.6 million owed to students and a serious qualification of the accounts stating ‘these conditions indicate the existence of a material uncertainty which may cast significant doubt over the company’s ability to continue as a going concern’,” Mr. Kealy said. He noted the director of safety regulation at the IAA had told the committee in October 2012 that many flight training companies were “like Ponzi schemes”. “A review of the PTC accounts would have shown this to be the case,” he said. IAA chief executive Eamonn Brennan told the committee in 2012 that the body regulates flight-training organizations in accordance with the European Union regulations for safety. Flight training organizations were not bonded companies either in Ireland or the United Kingdom. Mr. Brennan said the aviation authority examined whether such organizations had resources sufficient to maintain their simulators, aircraft and so on but did not consider the financial viability of such a company. KANSAS CITY, Kan. - It was a day to remember for one Kansas City, Kansas resident and longtime pilot Michael Jacobi. 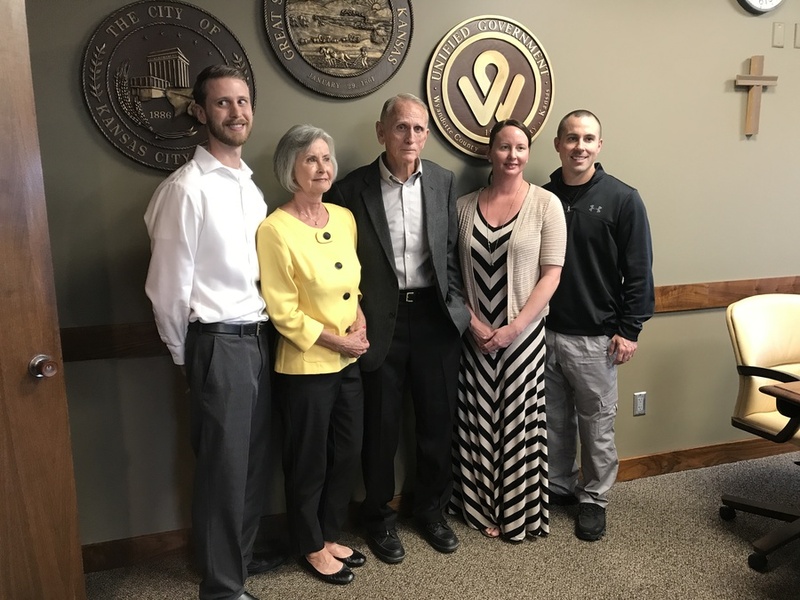 The Federal Aviation Administration awarded him with their highest honor Wednesday during a ceremony at City Hall with Mayor Mark Holland. Jacobi received the Wright Brothers Master Pilot award. This is the most prestigious award given by the FAA, recognizing pilots of 50 or more years of flying experience and contributions to general aviation. “It’s extremely humbling. There’s so many of us who aren’t here, so many of my friends,” Jacobi said. At the young age of 20, Jacobi flew combat missions during the Vietnam War with the 101st airborne division. He also flew special operations missions behind enemy lines in Laos. “We lost 200 aircraft and nobody knows about it," Jacobi said. According to Jacobi, his career is not over yet. He said he still flies today and will do so for as long as he can. "It's far safer than driving a car, by far,” Jacobi said. Jacobi’s son and son-in-law are also pilots, following in his footsteps. Myrtle Beach police won't be patrolling the skies this year. 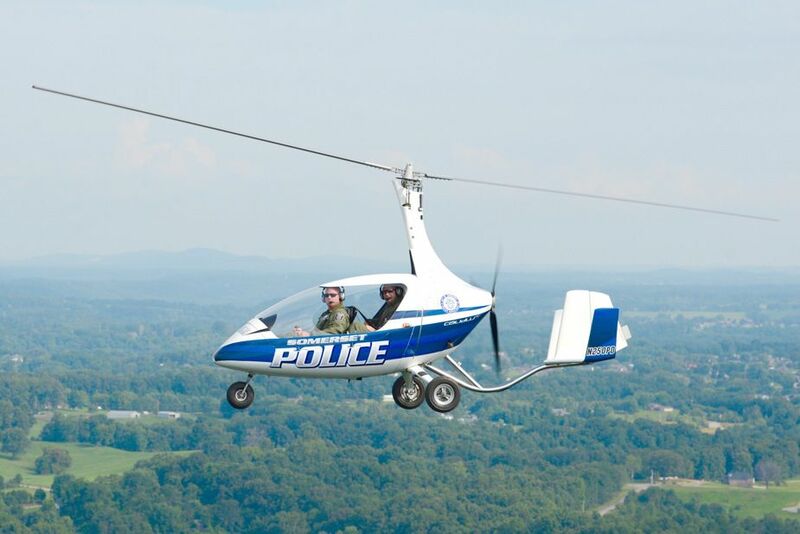 Rather than spend $207,000 on a gyrocopter — a two-person aircraft that looks like the combination of a helicopter and a small airplane — the city plans to put that money toward a mobile command center, city spokesman Mark Kruea said. "That's on hold for the moment," Kruea said of the aircraft purchase. The decision follows a recent opinion from the state Attorney General's office that says police could use seized drug money to buy a gyrocopter, but the city would violate state law by spending those dollars on fuel or maintenance for the aircraft. Last month, city officials announced plans to buy the gyrocopter to help with drug raids, survey the area after natural disasters and search for missing swimmers in the ocean. They said the aircraft would also help police monitor large crowds, such as those expected to come to this week’s Bikefest. The gyrocopter “would be a major benefit in enhancing our department’s ability to investigate and enforce illegal narcotic activities within our jurisdiction and outlying areas,” said James Battle, an attorney representing the police department, in a Jan. 20 letter to the state Attorney General’s Office. 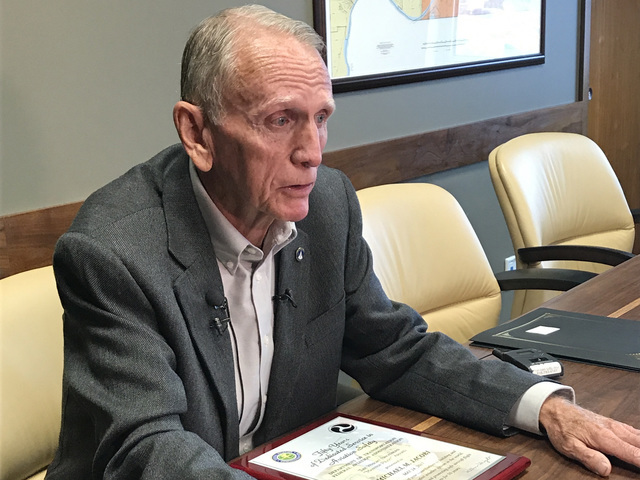 Battle asked the AG if the city would violate state law by using drug money to purchase the aircraft, pay for pilot training as well as cover maintenance and fuel. Although controversial, the civil forfeiture process allows law enforcement to seize money or property that authorities believe has been used in illegal activity. In some cases, money and items are taken from people who are not charged with any crimes. However, police departments are limited in how that money can be spent. In response to the city’s questions, Assistant Attorney General David Jones said in a May 17 opinion that a court would likely find money seized under the civil forfeiture statute could legally used to purchase a gyrocopter. Jones said those dollars could also pay for training pilots and purchasing equipment. However, he said the cost of fuel and maintenance should come from the city’s general budget, not forfeiture money. Jones added that even though the gyrocopter would be used for some police operations not directly tied to drug enforcement, that would not prohibit the city from buying it with forfeiture money. He offered an analogy of a D.A.R.E. patrol car that had been purchased with drug dollars. Primarily, he said, the car would be used for community outreach to prevent drug use among children. “If, however, a Category 5 hurricane devastated the county, or if a massive public event required a strong police presence to preserve order, it would be absurd to conclude that the General Assembly intended in such an ‘all hands on deck’ situation for that specific car to remain at the station while every other asset is in use,” Jones wrote. Kruea said the city was aware of the attorney general's opinion, but officials thought the mobile command center was a more immediate need. The command center money is set aside for the next fiscal year, which begins July 1. 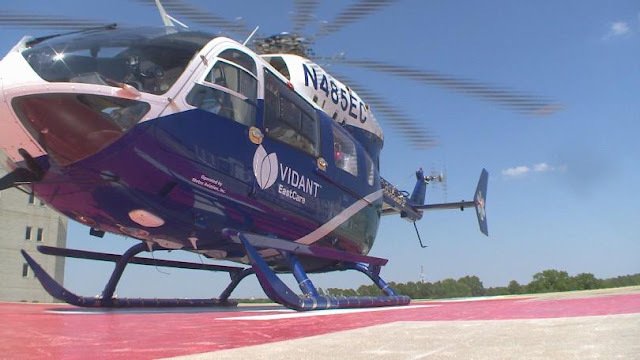 GREENVILLE, NC (WITN) - While you never want to need them, the sight of a Vidant EastCare helicopter crew landing nearby means that help is only a short flight away. These unique crews care for patients who need help the most from across Eastern Carolina. They work in 3-person teams: a pilot, a flight nurse and a flight paramedic or EMT. A former Army pilot, Carl Glover Jr. said, "this is a whole different type of flying for me." Flight Nurse Katie Wilfawn worked in an emergency room for 8 years before joining the EastCare team. "It's very different from a bedside nurse, that is for sure", she said. With 17 years experience as a paramedic, Ross Miller, said "I'd never been on a helicopter before I started this." Together, they're a team transporting the sickest patients in Eastern Carolina. They generally run two kinds of calls. There are inter-facility calls, transporting people from one medical facility or hospital to another; and then they do scene runs, landing directly on a highway or nearby field where an emergency situation is unfolding. "Scene runs can be crashes, someone having a heart attack, somebody having a stroke... we go as close as we can, local EMS calls us to a scene, we go in and we get the patient care quicker," said Scott Sampey, a Vidant EastCare program administrator. "You'd be surprised how much room there is on a highway or even in a field or a hospital pad, some of those places are engineered just for that purpose, obviously, but highways, there's usually room if you're avoiding overpasses, cell phone towers too close to the interstate or even small byways, but we can get into some fairly small places provided there's no obstacles and it's safe to do so," said Glover. Wilfawn said, "One of my favorite things to do is scene calls, to go get those patients, to assume primary care and really take care of them." 17 pilots, 38 registered nurses, 27 paramedics, 35 EMTs, 10 dispatcher communication specialists and 9 mechanics make up the EastCare team. The fleet includes 5 helicopters and 8 advanced life support ambulances. They operate out of numerous bases in ENC, including landing pads at medical centers or airports in Pitt, Beaufort, Nash, Craven and Wayne counties. From inside one chopper, Wilfawn says "everything an ambulance has we have available to us, plus a few more details." Those details include a multitude of medications, a cardiac monitor, a non-invasive CPAP and BiPAP machine plus two units of red blood cells and two units of plasma. The crew is in constant communication with EMS teams on the ground, and the doctors and nursing staff patients are being transported to. "To be able to get that patient from point A to point B is what our goal is and to get them there safely and hopefully in a better condition than we found them," said Miller. Their services proved essential last fall, when Hurricane Matthew flooded ENC leaving many roadways impassable. "During those 6 or 7 days after, when many of the roads weren't open and ambulances couldn't get around to get patients here, we did fly a lot of them. We flew 157 in one week, which is pretty incredible. That's a lot of flying, but we got the mission done and we helped out people," said Scott Sampey. Of course, even an air medical transport crew can't always fly. "My role is to make sure the aircraft is operated safely, and that all the parameters for safe operation are met, the weather's good, the crew and I all agree that there's nothing that would prevent us from safely taking a patient flight, that the hazards are identified and that we go from point A to point B without incident," said Pilot Carl Glover Jr.. The decision whether or not to fly is determined based on safety. "The system is set up so it tries to eliminate the type of patient you're carrying from the decision to fly and go get the patient so when I'm asked to go fly, we get together as a crew we decide if the weather's right, if the aircraft is ready, and we decide all that prior to even hearing what the patient is," said Glover. The system helps remove emotion from their decision, as much as possible. "You take the good and the bad everyday," Wilfawn said. "It's very possible that I could go to a scene and pick someone up that I actually know so the ownness is on the crew to make sure that we're doing the best job we can the safest we can to get that patient where they need to go quickly," Glover said. 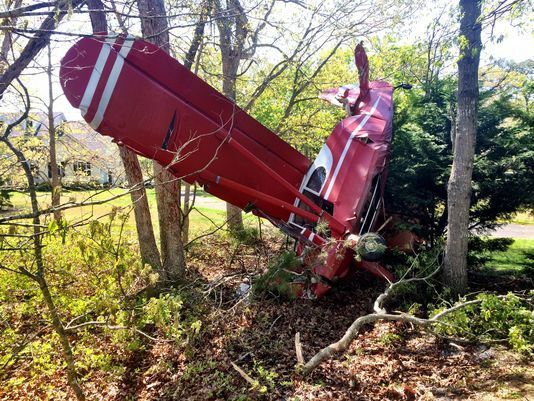 On May 16, 2017, about 2030 eastern daylight time, a Stinson 108-2, N9366K, was substantially damaged during a forced landing near West Creek, New Jersey. The private pilot received minor injuries. The airplane was privately owned and operated. The personal flight was conducted under the provisions of Title 14 Code of Federal Regulations Part 91. Visual meteorological conditions prevailed, and a visual flight rules flight plan was filed for the cross-country flight. The flight originated from Eagles Nest Airport (31E), West Creek, New Jersey, around 2020, and was destined for Frederick Municipal Airport (FDK), Frederick, Maryland. According to the pilot, he departed earlier that morning from FDK, flew to Sanford, Maine, and was returning to FDK, with several scheduled fuel stops. Throughout the day, he landed at seven airports, and reported no anomalies with the airplane. Before he departed 31E for the final leg of the flight back to FDK, he topped the airplane off with 26 gallons of fuel. After departure, the pilot flew toward the coast of New Jersey, and about 2,000 ft mean sea level, the engine began to "shake." He immediately turned the airplane back toward 31E, and soon after the engine lost all power. Smoke filled the cockpit and the pilot noticed an "orange glow" under the floor boards near the firewall. The pilot initiated an emergency descent, turned the fuel selector to the off position, and noted that the "orange glow" stopped. 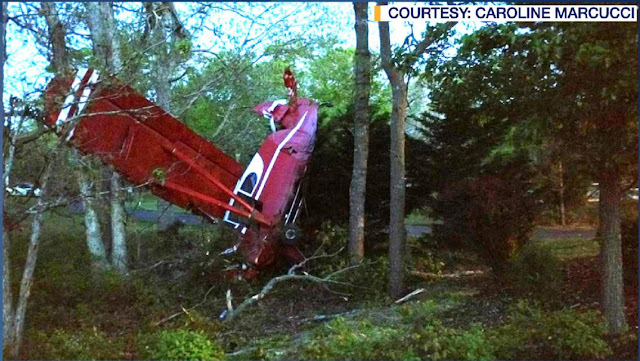 The pilot attempted to return to 31E, however, the airplane struck trees and terrain about 1 mile from to the approach end of the runway. Examination of the wreckage by a Federal Aviation Administration Inspector revealed that it came to rest in a near vertical attitude. Both wings exhibited leading edge crush damage and the empennage was bent toward the right. The engine remained attached to the airframe. Examination of the engine revealed a breach in the top section of the crankcase. According to FAA records, the airplane was manufactured in April 1947. It was equipped with a Franklin 6A4-165-B3, a 165-hp, engine. The most recent 100-hr inspection was performed on September 16, 2016, at a Tachometer time of 1039.6. According to the engine maintenance logs, the valve clearances were checked on the engine when the Nos. 3 and 6 cylinders were replaced for low compression on June 19, 2015, at a tachometer time of 945.3 hours. In addition, the Nos. 2 and 5 cylinders were replaced for low compression on September 16, 2016, at a tachometer time of 1039.6 hours. The maintenance records did not note another valve clearance check or have a recorded overhaul since the engine was rebuilt in 1970 and no information about engine operation from June 24, 1971 through June 19, 2015. Furthermore, the manufacturer recommended valve clearance check was every 200 hours at a minimum and overhaul was at 600 to 700 hours. At the time of the accident the airplane had accumulated 1125.2 hours on the tachometer. An examination of the engine revealed that the No. 4 cylinder was fracture separated from the crankcase. The piston, sections of the cylinder, and sections of the crankcase were missing. The crankshaft and remaining cylinders were intact, and the engine rotated smoothly when the propeller was turned by hand. The exhaust pushrod shroud and exhaust pushrod of the No. 4 cylinder were both bent. The No. 4 exhaust valve stem was fractured about halfway along its length. The lower half of the stem and face were missing. The No. 4 exhaust valve guide clearance was excessive, the guide and tip area of the valve contained carbon deposits. The cylinder walls contained circular gouges consistent with the exhaust valve face diameter. The remaining section of the No. 4 exhaust valve stem was sent to the NTSB Materials Laboratory for examination. The examination revealed that the valve stem exhibited reverse bending fatigue crack propagation. In addition, high levels of lead (Pb) and bromine (Br) were present on the exhaust valve. These elements were consistent with constituents in combustion compounds derived from the tetraethyl lead additives added to avgas aviation fuel. More information can be found in the Materials Laboratory report in the docket for this case. According to the Sky Ranch Engineering Manual, "high temperatures in the exhaust valve guide oxidizes oil and forms carbon deposits on the valve guide and these deposits" can result in a stuck valve condition. Furthermore, the "most frequent reason for elevated valve temperatures is valve leakage. All of the combustion gas must pass around the valve face as it goes out the exhaust port. A valve that is not contacting the seat properly cannot conduct as much heat into the cylinder head as a valve with good seating. Elevated valve stem temperatures may then" result in a stuck valve. Then, because of "high temperatures and combustion deposits on the exhaust valve stem, this area of the guide gets bigger. This increases the clearance between the guide and the stem and allows combustion products and heat to travel up the valve stem. These combustion products create lead deposits and acids which increase the corrosive environment." On May 16, 2017, about 2030 eastern standard time, a Stinson 108-2, N9366K, was substantially damaged during a forced landing near West Creek, New Jersey. The private pilot received minor injuries. The airplane sustained substantial damage. The airplane was privately registered to and operated. The personal flight was conducted under the provisions of 14 Code of Federal Regulations Part 91. Visual meteorological conditions prevailed and a visual flight rules flight plan was filed for the cross-country flight. The flight originated from Eagles Nest Airport (31E), West Creek, New Jersey, around 2020, and was destined for Frederick Municipal Airport (FDK), Frederick, Maryland. On May 16 at about 8:30 p.m. a transient aircraft departed Eagles Nest Airport. Shortly after takeoff, the pilot turned back to Eagles Nest and prepared to make an emergency landing. 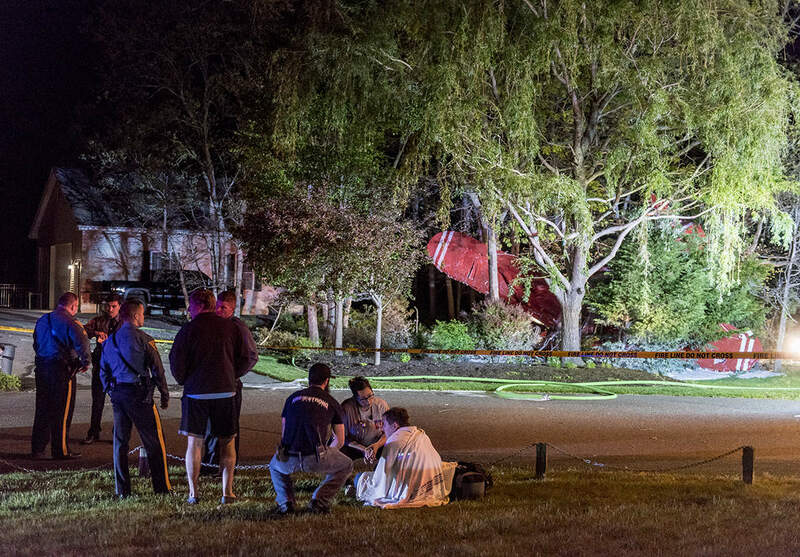 With insufficient altitude, his glide required an off-airport landing and he landed on Laurel Lane. The cause of the crash is under investigation. I want to commend the immediate and professional response of the Eagleswood Volunteer Fire Co., Eagleswood Mayor Michael Pasternak and the State Police. I also want to acknowledge the community response and the assistance of the residents living on Laurel Lane and the surrounding streets. John Pallante, James Girgenti Sr. and Nick Caricato, pilots who maintain aircraft at Eagles Nest, responded on my behalf in accordance with our emergency response plan. Their professional assistance on the scene was most helpful and appreciated by the State Police and me. I was in telephone contact throughout the evening with my team, the mayor and the State Police. This was an unfortunate accident. I continue to monitor and improve safety and enforce rules and regulations at Eagles Nest and will work with the community and town leadership to maintain safety. BLADE: Skip the traffic. Enjoy the view.